1. How did you learn about WHU and its Master Programs? I heard about WHU for the first time while I was still attending my Bachelor studies in Hohenheim. An assistant from one of the chairs at my university was a former student from WHU. He told me a lot of different things and stories, gathering more and more of my interest in the university. Consequently, I started informing myself more thoroughly via different web portals and by writing to WHU’s Master office. Since then, I was hooked a hundred percent and wanted dearly to attend WHU’s Master Program. 2. Why did you choose WHU instead of other universities? There are a lot of things which make WHU special. The school has a very good reputation and the Master Programs offer, in comparison to other universities, much more flexibility in the selection of your courses. Yet, in the Master in Finance, for instance, you can choose some Management courses. Besides that, classes at WHU are mostly very small, leading to a more direct and personal contact to the professors, which is also beneficial to the overall learning experience. Just recently, for example, I had a class with just four participants, which lead to a very intense and unique learning environment. WHU is also a very international school. The Master in Management has around 25 percent and the Master in Finance has about 60 percent of international students. And with almost 200 partner universities all over the globe, there are a lot of good schools and interesting places you can choose from for the mandatory exchange semester. However, the main reason for me to apply to WHU was the outstanding career network the school offers. The Career Center is doing a fantastic job, supporting students as much as possible, for example by organizing company presentations at the campus, but it also offers a very good and thorough screening of coverletters and CVs, when applying for internships. The alumni network “In Praxi” with over 3.000 active alumni is just impressive and really helpful. Very often when a company visits our campus, there are WHU alumni accompanying the recruiters because they work in this company. As they really know the school and its programs, as well as about the quality of students, the atmosphere during such career events is far different compared to normal recruiting events. 3. How did you experience the admission process? It was an extremely fast process. Even before I submitted my application, I was in contact with the Master office. They answered all my questions very quickly and were very helpful. The admission day itself was very interesting. Firstly, it was fun to meet a lot of people from all across Europe. Secondly, the interviews were challenging, but I also learned a lot and had some good discussions. I liked that these conversations were not so much about technical issues but much more about how you fit into the WHU as a person. It also did not take long to receive feedback about my admission. Overall, it was a very well organized and quick admission process. One important aspect, I want to emphasize about the application to WHU, is the biographical questionnaire. This document offers the opportunity to go into detail about the motivation to study at WHU. You certainly must put some effort into filling it out, but doing this thoroughly gives you a chance to really show your desire to be admitted to WHU. 4. 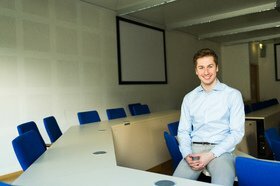 Are there any specific advantages in the curriculum of WHU’s Master in Finance? The Master in Finance offers a broad spectrum of finance courses from Corporate Finance to Investment Banking to courses about Behavioral Finance and much more. In addition, WHU allows you to choose some courses out of the Master in Management, giving you the chance to broaden your knowledge and to graduate from WHU with more than a specialization in Finance. We usually have small classes, which enables you to really discuss your findings with the other course participants and the professors. In general, the faculty is very approachable. You really can visit all lecturers in their offices, and most of the time they will be really keen to help you. I also like the way the courses are structured. We have to work on case studies, which give you a very good impression of the problems and challenges you will face in the real business world. Just recently, the M&A-team of the Commerzbank came to one of our courses, working through a valuation case study with us. In such situations, classwork becomes more than just learning, it also becomes some sort of networking- and recruiting-event. 5. What kind of feeling is it to finally arrive at WHU and start studying here? I felt quickly integrated. The Welcome Week helped a lot in this regard. Within a short period of time, I had talked to most of my fellow students, knowing nearly all of them by name. Also, as soon as the classwork began, you quickly realize how intense it is going to be here. And then, you start feeling the WHU spirit. People stick together, help each other, and organize interesting and unique events together. Euromasters, Campus for Finance or IdeaLab! are just a few of the possible events you can experience in Vallendar. Just after a couple of weeks you understand why WHU has such a great reputation, why it is so great here, and why people want to study here. Students in both Master Programs are extremely motivated, and this motivates yourself to study hard yourself. I truly can say that I have never regretted coming here. 6. What advice do you have for students who are interested in WHU’s Master Programs? Other than taking the biographical questionnaire seriously, the first thing I would recommend is that students should not underestimate the workload at WHU. You will have to do some important case studies, and sometimes you will work until two o’clock at night. However, while on the one hand this does not allow you to do much other stuff at times, on the other hand, it prepares you for the intensive workload later in your job in the business or finance world. And this is one of the reasons why WHU is as good as it actually is. Thus, do not put too much emphasis on the location of WHU. Yes, Vallendar is just a small town, but this is the right place if you want to work hard. Moreover, it is perfectly located for the impressive career network of the school. WHU has the best Career Center in Germany and additionally Frankfurt area, Luxembourg, the whole Rhineland, and other important regions are not far from Vallendar.